Background: In the last decade, tremendous changes occurred in the treatment and follow-up of the patients with chronic myeloid leukemia (CML), with continuous update in the close molecular monitoring of treatment for the presence of minimal residual disease. Objectives: The objective of this study was to evaluate the molecular monitoring of patients with CML on tyrosine kinase inhibitor (TKI) treatment and categorization of those patients according to the European Leukemia Net (ELN) guidelines. Materials and Methods: This observational cross-sectional study was conducted among all patients with CML registered in Oncology and Hematology Centers in Middle Euphrates of Iraq including 244 patients from April 2013 to April 2016. Eligible patients were 199 cases while 45 cases were excluded from the study. Venous blood in ethylenediaminetetraacetic acid was collected with each time of molecular monitoring to assess the level of messenger RNA of breakpoint cluster region-Abelson (BCR-ABL) by quantitative reverse transcriptase-polymerase chain reaction (RT-PCR) (Cepheid, Gene Xpert Diagnostic System). Results: Most of the patients were in young adult age group with disease predominance more in females than males. Majority of the patients (72%) achieved optimal response after 12 months of treatment according to the ELN guidelines and 28% showed primary resistance to TKI. Some patients with optimal response (9%) will develop secondary resistance to treatment. Conclusion: Most of our patients achieved major molecular response after 12 months of treatment with TKI according to the ELN guidelines that reflect proper management and regular follow-up of the patients by quantitative RT-PCR for the detection of BCR-ABL level. In this study, we try to evaluate the molecular monitoring of patients with CML on TKI treatment and categorization of those patients according to the ELN guidelines. Data of 244 patients with CML registered in three Oncology and Hematology Centers in Babylon, Najaf, and Karbalaa incorporation with Al-Nahrain Medical Laboratory included patient name, age, address, date of diagnosis, and serial records of molecular findings. Some additional information was completed for those without complete data available in their sheets by phone call or direct questionnaire. 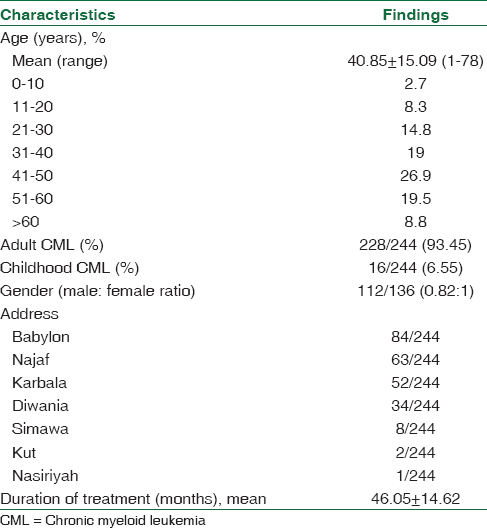 This is an observational cross-sectional study among a group of Iraqi patients with CML registered in Oncology and Hematology Centers in Middle Euphrates of Iraq including Babylon, Najaf, and Karbalaa Centers living in the community of middle Euphrates of Iraq of different areas from Babylon, Najaf, Karbala, Diwania, Simawa, and Kut cities. This study was carried out from April 2013 to April 2016 to evaluate the molecular monitoring of patients with CML on TKI treatment and categorization of the patients on the map of international guideline. This study was conducted in association with these three Oncology and Hematology centers and Al-Nahrain medical laboratory in Iraq-Karbala. A total of 244 patients with CML were registered in these three Oncology and Hematology Centers, 45 patients were not eligible for the study either due to their new diagnosis (<3 months) or loss of their data or communication. The remaining 199 patients eligible for the study included those completed 6-12 months of treatment with TKI after diagnosis with available full data about their BCR-ABL level during the period of treatment [Figure 1]. All patients with CML registered in these three centers who complete 6-12 months of TKI treatment with available data of serial BCR-ABL level during the treatment were included in the study. Primary resistance patients include those completed 6-12 months of treatment with TKI and their MR to treatment was either warning (BCR-ABL level 1%-10% IS after 6 months or 0.1%-1% IS after 12 months) or failure (BCR-ABL level >10% IS after 6 months or >1% IS after 12 months) according to the ELN guideline for molecular monitoring of patients with CML on TKI. Secondary resistance patients include those completed 6-12 months of treatment with TKI and their MR to treatment was optimal (BCR-ABL level <1% IS after 6 months or <0.1% IS after 12 months) according to ELN guideline but lose their response at any time during the period of treatment that did not fit for optimal response criteria. We excluded 45 patients with CML those registered in the Oncology and Hematology centers but either newly diagnosed (<3 months of treatment) or lost their data, lost communication, and poor adherence to treatment. Adherence of patients to treatment was approved as possible with oral or phone communication with each patient to exclude the possibility of poor compliance as a cause of response failure. Power calculation: Cross-sectional study included all patients registered in these centers with no effect of the number on the power of study. During the regular follow-up of the patients with CML, venous blood was taken from all patients in sterile venipuncture to assess the BCR-ABL oncogene level according to the national guideline for molecular monitoring depending on the ELN guideline. Two milliliters was collected in ethylenediaminetetraacetic acid (EDTA) tube for complete blood count (CBC) and measurement of BCR-ABL oncogene level by RT-PCR. CBC (including Hb, packed cell volume, red blood cell indices, white blood cell, total and differential count, and platelet count) was measured within 1 h of blood collection in EDTA tube using fully automated Hematology autoanalyzer (Swelab-Swede) in Al-Nahrain medical laboratory. The level of BCR-ABL messenger RNA p210 transcript in peripheral blood was measured using peripheral blood collected in EDTA tube that can be used immediately or can be stored for 2-3 days at 4°C. Quantitative RT-PCR (Cepheid Gene Xpert Diagnostic System, Cepheid, USA) that was standardized according to IS by comparing transcript levels to one of the specific control genes was calibrated to the WHO international genetic panel for quantitation of BCR-ABL mRNA, using Xpert BCR ABL monitor kit according to the manufacturer's recommendation, and the patients' result was expressed as % IS. This process was done in Al-Nahrain medical laboratory located in Karbalaa, Iraq, with license from the Iraqi Ministry of health (updating: no. 24625 on May 2, 2012). The demographic features of patients are illustrated in [Table 1]. Based on these data, mean age was calculated as 40.85 ± 15.09 for all patients, mainly in young adult age group with 6.55% of the patients are children <17 years of age. There was a difference between the number of male and female patients, as male-to-female ratio showing slight predominance in female patients (M:F; 0.82:1). It was noticed that the address of the patients was distributed in different areas of Middle Euphrates of Iraq including 84 cases from Babylon, 63 Najaf, 52 Karbala, 34 Diwania, 8 Simawa, 2 Kut, and 1 from Nasiriyah. The mean duration of all patients with CML was 46.05 ± 14.62 months. About 72% of the patients achieved optimal response to TKI after 1 year of treatment while 28% did not, while after 6 months of treatment, 77% achieved optimal response compared to 23% who did not reach the recommended level of MR either in warning or failure group according to the ELN guideline for molecular monitoring [Table 2] and [Table 3]. After 1 year of treatment, 28% of the patients showed primary resistant to TKI and 9% of those with optimal response showed secondary resistance to treatment [Table 4]. Details of patients' result of their BCR-ABL level are shown in [Table 5] that majority of the patients with optimal response (72%) after 12 months of treatment had oncogene level <0.1% IS (MMR, 3 log reduction) and others showed different levels of deep MR (4 log reduction and more). In the last decade, tremendous changes occurred in the treatment and follow-up of the patients with CML, with continuous update in the close monitoring of treatment for the presence of minimal residual disease. The purpose of deep molecular response achieve by quantitative PCR for molecular monitoring for all CML patients on TKI will assess the response according to international guidelines of molecular monitoring like ELN and NCCN guideline. Iraqi guideline for molecular monitoring depends on ELN guideline and mainly on the result of 12 month rather than 6 month of treatment to eliminate the bias of single reading of quantitative PCR , yet the optimum regular monitoring is at 6 month in Iraqi guideline. Demographic features of our patients show that most of the patients are in the young adult age group that was not similar to most of the concept of patients with CML worldwide, as in the UK, about half of the patients are diagnosed at 65 years and above with median age around 60-65 years at diagnosis. , CML is mainly a disease of adults, having increasing diagnosis with advancing age. Chronic leukemias are rare in childhood and represent 3% of pediatric leukemias, and childhood CML usually <5% of all cases like in the UK update registration represent 1.2% of all cases, , while CML in our patients shows an increased tendency to occur in childhood than the usual findings. These findings may be related to the biological molecular bases of the disease in our society or the nature of our patients that tend to develop the disease in younger age group. More deep research about the pathophysiology of the disease in our patients is required to determine the proper explanation of such findings. Similarly, CML in our patients occurred more in females than males and this also differs in most of the patients in another area of the world  that shows male predominance than female, and again may be related to pathophysiology of the disease and why our females are more likely to develop CML than males. Regular follow-up of our patients on TKI in the past few years will change the policy of treatment and put baseline for molecular monitoring similar to international guideline due to availability of treatment and presence of facilities to detect the BCR-ABL level by quantitative PCR and proper correlation between different oncology and hematology centers in our country. Most of the patients in Middle Euphrates of Iraq are registered in Babylon Center because it is the oldest center in this area of our country and it has all requirements for this program similarly in the Najaf and Karbalaa Oncology and Hematology Centers. At 12 months of treatment with TKI, 72% of our patients achieved MMR (BCR-ABL level <0.1% IS, log reduction 3) and this percentage reflects the proper treatment and follow-up of the patients in different centers according to the ELN guideline, while 28% of the patients showed warning and failure response to treatment at this time which may be related to resistance of patient, drug bioavailability, or even drug adherence of patients. Most authors show that more than 50% of patients on TKI treatment will optimally response after 12 months. At 6 months of treatment, 77% of the patients showed optimal response, but at this point of treatment, the result may not reflect the real nature of the response and cannot depend on a single reading of oncogene level, so most of our assessment depends on 12-month treatment checkpoint for the residual disease. Primary resistance was seen in 28% of the patients on TKI while 9% of those with optimal response showed secondary resistance to treatment and increase in the level of BCR-ABL after initial well response. This secondary resistance may relate to common mutation or even new mutation effect on treatment activity. BCR-ABL level in optimal response patients is at MMR (<0.1 IS) whereas the remaining at different levels of deep molecular response (< 0.0032 IS). Our monitoring was done with gene Xpert quantitative PCR that validated to detect deep MR to a level of 4 log reduction and even more deep but without certainty. Most of our patients achieved MMR after 12 months of treatment with TKI according to the ELN guideline that reflects proper management and regular follow-up of the patients by quantitative RT-PCR for the detection of BCR-ABL level. Apperley JF. Chronic myeloid leukaemia. Lancet 2015;385:1447-59. Faderl S, Talpaz M, Estrov Z, O′Brien S, Kurzrock R, Kantarjian HM. The biology of chronic myeloid leukemia. N Engl J Med 1999;341:164-72. Buyukasik Y, Haznedaroglu IC, Ilhan O. Chronic myeloid leukemia: Practical issues in diagnosis, treatment and follow-up. UHOD 2010;20:1-12. Alsaraj MA, Alsaedi SJ. Iraqi Cancer Registery. Baghdad.minstry of health publication house. 2011;42-66. Melo JV, Deininger MW. Biology of chronic myelogenous leukemia - Signaling pathways of initiation and transformation. Hematol Oncol Clin North Am 2004;18:545-68. Kantarjian HM, Giles F, Quintás-Cardama A, Cortes J. Important therapeutic targets in chronic myelogenous leukemia. Clin Cancer Res 2007;13:1089-97. Kantarjian H, Schiffer C, Jones D, Cortes J. 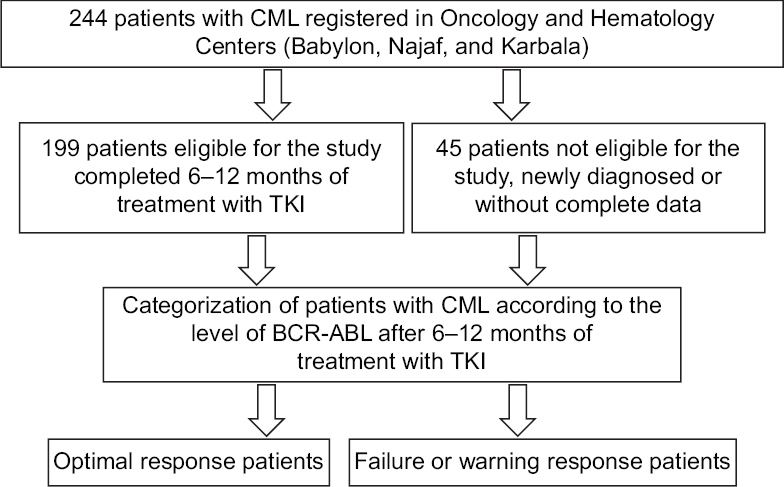 Monitoring the response and course of chronic myeloid leukemia in the modern era of BCR-ABL tyrosine kinase inhibitors: Practical advice on the use and interpretation of monitoring methods. Blood 2008;111:1774-80. Schoch C, Schnittger S, Bursch S, Gerstner D, Hochhaus A, Berger U, et al. Comparison of chromosome banding analysis, interphase- and hypermetaphase-FISH, qualitative and quantitative PCR for diagnosis and for follow-up in chronic myeloid leukemia: A study on 350 cases. Leukemia 2002;16:53-9. Bauer S, Romvari E. Interpreting molecular monitoring results and international standardization in chronic myeloid leukemia. J Adv Pract Oncol 2012;3:151-60. Baccarani M, Saglio G, Goldman J, Hochhaus A, Simonsson B, Appelbaum F, et al. Evolving concepts in the management of chronic myeloid leukemia: Recommendations from an expert panel on behalf of the European LeukemiaNet. Blood 2006;108:1809-20. Marin D, Kaeda J, Szydlo R, Saunders S, Fleming A, Howard J, et al. Monitoring patients in complete cytogenetic remission after treatment of CML in chronic phase with imatinib: Patterns of residual leukaemia and prognostic factors for cytogenetic relapse. Leukemia 2005;19:507-12. Marin D, Milojkovic D, Olavarria E, Khorashad JS, de Lavallade H, Reid AG, et al. European LeukemiaNet criteria for failure or suboptimal response reliably identify patients with CML in early chronic phase treated with imatinib whose eventual outcome is poor. Blood 2008;112:4437-44. Office for national statistics. cancer in UK [Internet]. London: office for national statistics; 2015 July. Available from: https://www.ons.gov.uk/peoplepopulationandcommunity/healthandsocialcare/conditionsanddiseases/bulletins/cancersurvivalinenglandadultsdiagnosed. [Last Accessed on 2016 Jul 13]. Baccarani M, Pileri S, Steegmann J, Muller M, Soverini S, Dreyling M. Chronic myeloid leukemia: ESMO Clinical Practice Guidelines for diagnosis, treatment and follow-up. Ann Oncol 2012; 23 (suppl 7): vii72-vii77. Patel AA, Patel KM, Jain AK. Chronic myeloid leukemia in childhood. GCSMC Med Sci 2013;2: 5-8. Höglund M, Sandin F, Simonsson B. Epidemiology of chronic myeloid leukaemia: An update. Ann Hematol 2015;94 Suppl 2:S241-7. Press RD. Major molecular response in CML patients treated with tyrosine kinase inhibitors: The paradigm for monitoring targeted cancer therapy. Oncologist 2010;15:744-9.